Love and Wine: A Thirst for Romance? This is just so good This family has been making wines for over a hundred years. 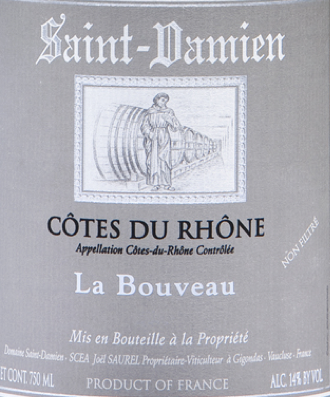 Grenache noir 65%, Mourvèdre 15%, Syrah 15%, Cinsault, Clairette and others 5%. Old vines and hand picked. No fining. Dark red to ruby color. Spicy with incense, lavender, pepper, and copious quantities of black cherry and raspberry fruit. Full-bodied. No fining. Parker points 90-93. Alcohol 14.5%. 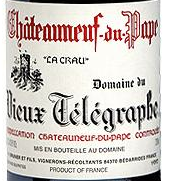 This entry was posted in Chateauneuf-du-Pape, Cote de Rhone, French Wine, Grenache, Vieux Telegraphe and tagged Beverages, Cinsaut, Food, Grenache, Mourvèdre, Syrah, Wine, Wine tasting descriptors. Bookmark the permalink.